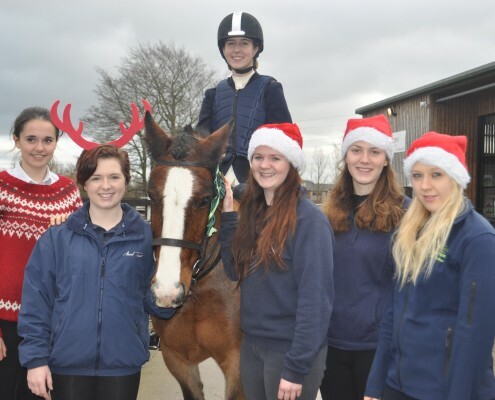 Neigh bells rang out at Reaseheath College’s Equestrian Centre, Nantwich, when Level 3 Extended Diploma in Horse Management students organised a Christmas themed horse show. The students ran a fun schedule which included showjumping, equitation and best turned out classes and a festive fancy dress competition hotly contested by students and their horses. There was also a dog agility class. The event was much enjoyed by fellow students and spectators from other departments. All entry fees and money raised from raffles and cake sales will go to Reaseheath’s RAG charity The British Heart Foundation and to the Thoroughbred Rehabilitation Centre. The students have to organise several events as part of their events management module and will run another show next Easter.